This combination is a targeted therapy for arthritis. Combination of glucosamine sulfate and chondroitin may be effective in slowing the breakdown of cartilage in the early stages of knee Osteoarthritis (OA). Research has also shown that the combination may help in reducing moderate to severe knee pain from OA. These compounds seem to work in a different way than NSAIDs. They take longer to achieve the same benefit, but the results tend to last longer than NSAIDs. Most importantly, they have fewer side-effects than NSAIDs. The benefits of type II collagen don't stop with Hyaluronic Acid (HA). HA is an important hydrating agent for tissue. It plays a critical role in maintaining healthy joint synovial fluid and preventing the degeneration of aging joints. It also serves as a free radical scavenger and antioxidant. It stimulates DNA synthesis and fibroblast cell division, essential for healthy skin and cartilage maintenance. Type II collagen, the collagen that makes up moveable joints, also provides a high level of chondroitin sulfate (CS). CS is an effective anti-inflammatory compound without the negative side effects of the non-steroidal anti-inflammatory drugs such as indomethacin and ibuprofen. It also enhances the synthesis of HA and cartilage proteoglycans in osteoarthritis patients, improving the quality of their joint tissue. Collagen II components 1) resist cartilage protein digesting enzymes; 2) reprogram destructive chondrocytes to lessen inflammation; 3) promote new cartilage and proteoglycon synthesis; 4) enhance production of HA, producing a thick, effective, lubricating synovial fluid that protects and cushions joints; 5) protect the surface of cartilage from oxidative (free radical) damage and enzymatic digestion; and 6) act as powerful anti-inflammatory/pain modulator. Osteoarthritis (OA), the most widespread type of arthritis, is a degenerative disease of the joints. Although sometimes capable of causing acute inflammation, it is most commonly a "wear-and-tear" disease involving degeneration of joint cartilage and formation of bony spurs within various joints which leads to loss of motion, stiffness and joint pain. Trauma to the joints, repetitive occupational usage, and obesity are risk factors. Most people over 60 years of age have this affliction to some extent, with approximately 16 million sufferers requiring medical care. The main goal of treatment is to relieve pain. Glucosamine and chondroitin have been widely promoted as a treatment for OA. Glucosamine, an amino sugar, is thought to promote the formation and repair of cartilage. Sulfate part of glucosamine sulfate is also important. Sulfate is needed by the body to produce cartilage. This is one reason why researchers believe that glucosamine sulfate might work better than other forms of glucosamine such as glucosamine hydrochloride or N-acetyl glucosamine. These other forms do not contain sulfate. Glucosamine is needed by the body to produce a variety of other chemicals that are involved in building tendons, ligaments, cartilage, and the thick fluid that surrounds joints. Chondroitin, a carbohydrate, is a cartilage component that is thought to promote water retention and elasticity and to inhibit the enzymes that break down cartilage. Both compounds are manufactured by the body. Recent studies have shown that the combination of glucosamine sulfate and chondroitin may be effective in slowing the breakdown of cartilage in the early stages of knee OA. Research has also shown that the combination may help in reducing moderate to severe knee pain from OA. As per some studies, certain patients with mild to moderate osteoarthritis who take the supplements may have pain relief at a similar level to patients who take Non-steroidal anti-inflammatory drugs (NSAIDs). An important substance present in articular cartilage and synovial fluid is called hyaluronic acid (HA). It is present as a coat around each cell (chondrocyte).Hyaluronic acid helps joints collect and hold water, improving lubrication and reducing friction. It also acts by allowing cells to move and work within the joint. HA can absorb up to 3,000 times its weight in water and is an important hydrating agent for tissue. It plays a critical role in maintaining healthy joint synovial fluid and preventing the degeneration of aging joints. It is also a regulatory molecule influencing cell movement, phagocytosis and blood vessel formation. It also serves as a free radical scavenger and antioxidant. HA stimulates DNA synthesis and fibroblast cell division, essential for healthy skin and cartilage maintenance. By the time a person reaches age 30, his or her HA becomes disorganized from skin collagen protein. The benefits of type II collagen don't stop with HA. Type II collagen, the collagen that makes up moveable joints, also provides a high level (typically 20 percent) of chondroitin sulfate (CS). 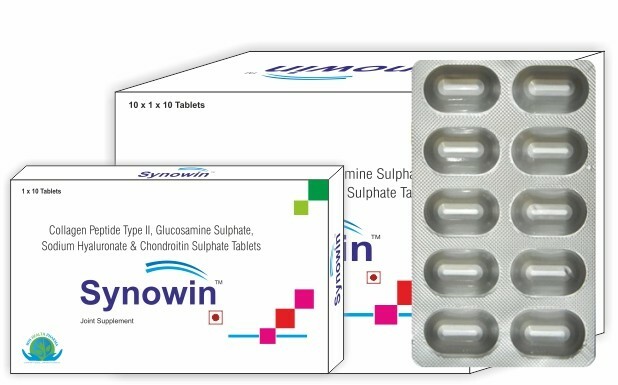 CS is one of six glycosaminoglycans (GAG) that help form the connective tissue of skin, tendons, cartilage, ligaments and bone matrix. Partially depolymerized (i.e., shortened chain length) CS is an effective anti-inflammatory compound without the negative side effects of the non-steroidal anti-inflammatory drugs such as indomethacin and ibuprofen. CS also enhances the synthesis of HA and cartilage proteoglycans in osteoarthritis patients, improving the quality of their joint tissue. It also inhibits enzymes such as collagenase, elastase and proteoglycanase that become overactive in joint degeneration and skin aging, destroying cartilage and connective tissue. Type II collagen also contains cartilage matrix glycoprotein (CMGP). CMGP enhances the antioxidant protection within joints by carrying the essential trace mineral copper to the chondrocytes. Chondrocytes are small cells interspersed within the cartilage matrix of joints. The chondrocytes produce new collagen and mucopolysaccharides to keep joints well cushioned and lubricated. The chondrocytes also produce and secrete copper SOD (superoxide dismutase), a free radical-destroying enzyme that is critical to protect joint tissue from the free radical damage that occurs as part of the process of joint degeneration. Hydrolyzed type II collagen have multiple protective benefits. Collagen II components 1) resist cartilage protein digesting enzymes; 2) reprogram destructive chondrocytes to lessen inflammation; 3) promote new cartilage and proteoglycon synthesis; 4) enhance production of HA, producing a thick, effective, lubricating synovial fluid that protects and cushions joints; 5) protect the surface of cartilage from oxidative (free radical) damage and enzymatic digestion; and 6) act as powerful anti-inflammatory/pain modulator. Particularly in situations in which cartilage is under massive stress [e.g., arthritis, obesity, sports injury, etc. ], the intake of collagen hydrolysate could be highly significant and reduce degenerative changes. It is found that native collagen had no stimulatory effect on chondrocytes, but cells fed the hydrolyzed collagen increased their production of type II collagen 250 percent. High level of safety makes collagen attractive as an agent for long-term use in these chronic disorders. Taking this combination with food seems to reduce the incidence of the above side effects. ●	Shellfish allergy: Most glucosamine supplements are made from shellfish although some made from non-shellfish sources are now available. Talk to your doctor or pharmacist, before taking it, about whether the supplement is safe for you. ●	Bleeding: People taking the blood thinning medicine warfarin should talk to their doctor before starting, stopping or changing their dose of glucosamine as it may interact with warfarin and make the blood less likely to clot. ●	Diabetes: Glucosamine is a type of sugar so check with your doctor before taking glucosamine if you have diabetes. ●	Pregnant or Breastfeeding Women: There have not been enough long term studies to clearly say that his combination is safe for a developing baby. Pregnant women should talk to their doctor before taking glucosamine.